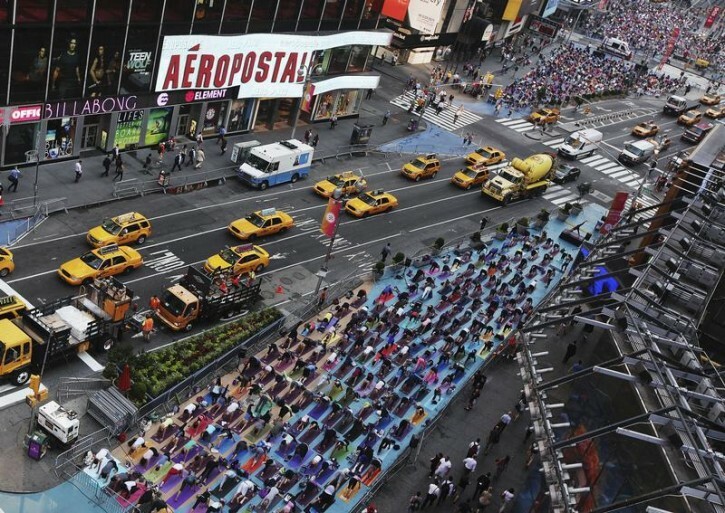 Manhattan, NY - One of the busiest crossroads in the world is coming to a standstill as yoga enthusiasts take over Manhattan’s Times Square to celebrate the longest day of the year. The “Mind over Madness” event on Friday includes free classes, activities and giveaways from 7.30 a.m. until 9 p.m.
Thousands of people are expected to roll out their yoga mats throughout the day. All skill levels and ages are welcome. President of Times Square Alliance and co-founder of the event Tim Tompkins says that part of the event’s appeal was finding stillness and calm in the middle of the city rush. The summer solstice tradition has grown from just three people to more than 15,000 and is now in its 11th year. This world has gone crazy, if you want this sort of kinus do it in MSG, why block a perfectly good road. It's time brother and sisters, this land is not our land. I've been these types of events at Central and Prospect Parks and surprisingly, there are quite a few guys with kipahs and I suspect frum women as well (although they are less obvious). Many shuls have now added yoga classes (primarily for women only for tzinius reasons) and the demand is growing. A bas yisroel with 6 kids at home finds an hours of yoga streching an meditation to be the high point of the week which provides relief from the tumult, noise and general craziness of her time at home. Hopefully, more shuls will sponsor such clasess as a great contribution to the physical and emotional health of their tiziburs. “ This world has gone crazy, if you want this sort of kinus do it in MSG, why block a perfectly good road. Don't let the door hit you in the behind on your way out.